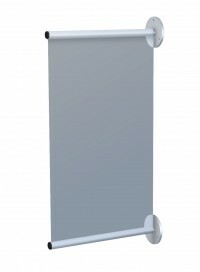 We carry a large selection of sign hanging hardware including options for poster hangers for heavy or lightweight material including fabric, and banner hangers that use either the same systems or metal dowels for banners with pole pockets. 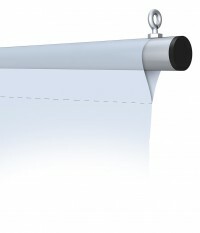 We also offer a remote controlled banner hoist system that raises and lowers the banner to make changing banners easy and inexpensive, even when hung up to 70 feet above the ground. These displays are popular for hanging all kinds of signs, posters and banners and are widely used in retail stores, grocery stores, shopping malls and convention centers. They provide an easy, cost effective and attractive way to hang these promotional signs, and allow for simple changes of the posters and banners. 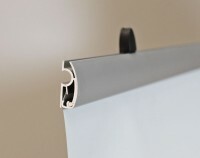 We offer different styles of poster and banner hanging hardware for indoor displays including the SnapGraphics line of poster hangers that opens and snaps closed to hold the poster or banner, the aluminum dowel Trapeze Bars banner holders that are designed for banners with pole pockets, and the Auto Flying Banner Hoist for raising and lowering banners for easy changes. 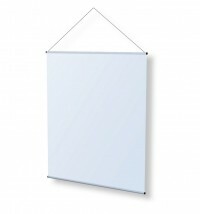 SnapGraphics sign hanging system are plastic poster hangers that come in many sizes and a choice of colors. 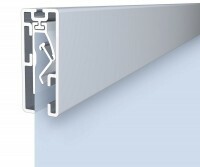 They are also used in the aluminum poster hangers as the plastic gripper bars fit into aluminum extrusions. These are ideal for customers who need greater rigidity and a more upscale look. 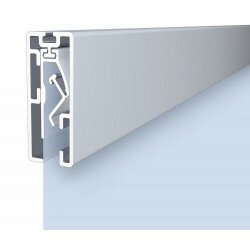 These aluminum versions can also be used to hold thicker materials such as foam board mounted prints up to 3/8" thick with the addition of the appropriate accessories. The Trapeze Bars are designed to hang banners with pole pockets, and they come in a wide range of sizes to accommodate most any banner hanging need. 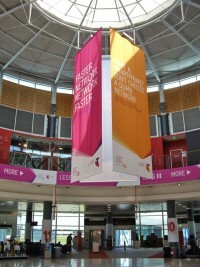 Posters printed on stiffer material such as poster board or even mounted on thin, rigid materials can be used with either the EasyGraphics or SnapGraphics styles, while banners and more flexible materials are best used with the SnapGraphics style of poster and banner hangers that snap open and closed to grip the graphic. Even lightweight fabrics and very thin materials work well with the SnapGraphics products. Each of these styles comes in a range of sizes, finishes and colors to provide solutions for any possible poster and banner hanging need. 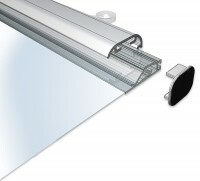 We also sell a range of hanging accessories to allow the sign hanging hardware to be attached to variety of different ceiling types, and there are even accessories for attaching some of these products to walls, slat wall and other surfaces. 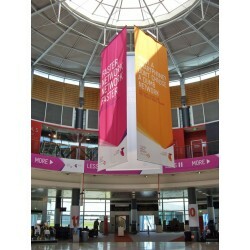 The Auto Flying Banner Hoist can be used with banners that have pole pockets, or it can also be used in combination with our other banner hangers, such as the the SnapGraphics, or even with graphics in frames. The remote controled banner hoist lowers the banner to make changes easy without the need for lifts or ladders, and raises it back to the desired height with the push of a button. 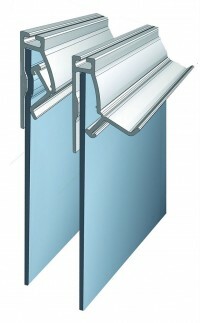 Browse through all the options below and contact us for assistance if you don't see the display you need.